Yesterday confirmed two things I already knew about myself: I can be irrationally emotional and…I love carbohydrates. Why is it that those two issues seem to run in congruency? When one rears its ugly head, here comes the other. I can’t even explain why yesterday caused me to be such an emotional mess, but I was just in a terrible, no good mood. Monday, perhaps? I’m just not quite sure. But at my hockey game, one of the guys on my team said, “Hey, you gotta turn around” (as we were breaking out the puck) and while I agree, I was in motion towards doing so and his tone just made me want to burst into tears right there. Even after the very kind captain of the team overheard and assured me, “Don’t worry about him, Nicole…he’s a jerk to everyone”…I still wanted to cry. I got home and Mr. Prevention was getting ready to catch up with the DVR. Just as I was getting ready to head up for a shower and then to join him for some TV, I was going to detour into the kitchen for a bite of some oh-so-good chocolate from Germany that Mr. Prevention brought back from a recent work trip. Needless to say, I bypassed the chocolate and grabbed my water bottle. Mom, this flour shoutout is for you. My dear mother SWORE to me she couldn’t find “whole wheat pastry flour” or “white wheat flour” in her ginormous Chicagoland grocery store. I didn’t believe if for one second. Low and behold, even my not-so-grocery-savvy dad was able to find the flour and proudly returned home with a 5 pound bag while I was home last weekend. Such products make my carb habit not so sinful! In a mixing bowl, whisk together the flour, baking powder, salt, and sugar. In another bowl, mash the banana with a fork against the side of the bowl; add the egg and whisk to combine. Whisk in the vanilla, buttermilk, and milk. Combine the dry and wet ingredients. Stir gently with a rubber spatula until ingredients are combined. 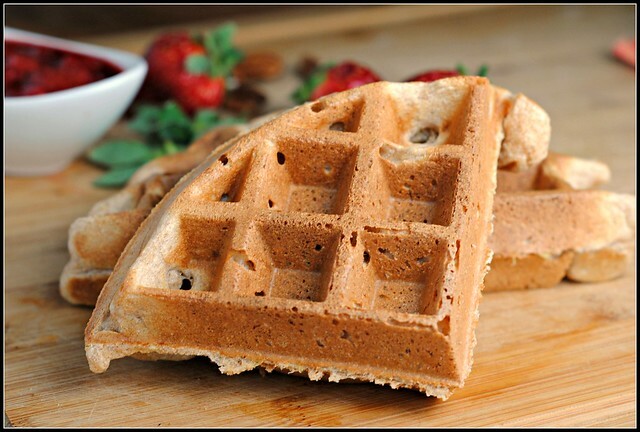 When the waffle iron is ready, scoop a generous 1/3 cup batter into each square of the waffle iron (or whatever your iron requires). Close the top and let the waffles cook until done. Meanwhile, heat the strawberries, vinegar, water and sugar in a small sauce pan over medium-high heat. Once hot, slightly mash some of the strawberries to form a chunky syrup. 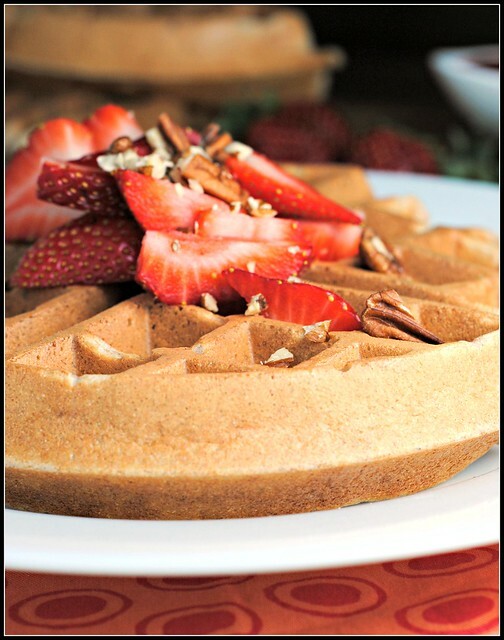 Top the waffles with several tablespoons of the topping and a sprinkling of pecans. Result: Delicious! 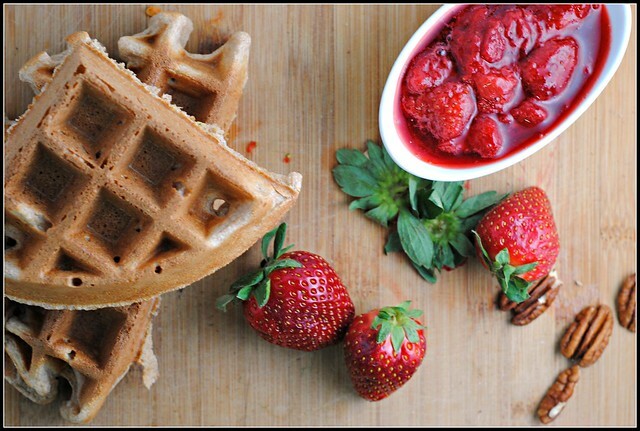 I had to cook these a bit longer to get the waffles to stick together in my waffle iron, but other than that, this recipe was simple to make and the flavors were great. After making blueberry balsamic topping for corn pancakes, I wanted to go the balsamic vinegar route again. Good choice 🙂 Strawberries and bananas are a classic combination and I’ll have waffles for breakfast…or dinner, any day! These look delicious! Without the butter or oil found in many waffle recipes, are they crispy on the outside, or are they more of a soft waffle? we all have those days Nicole for no reasons but I am glad that its over 🙂 These pancakes def. 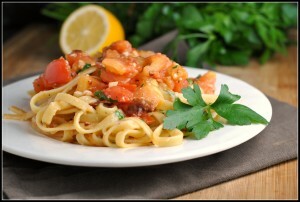 looks deliciousss!!! 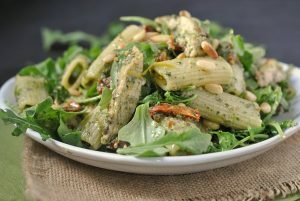 I loves me some carbs, too, and I find I really crave them when I’m stressed (like now!) So I’ve been trying to make healthy carb choices and balance them with lots of veg and lean protein. Oh, and I hope today’s a better day for you! Sounds like you could use a little R&R and I hope you’re able to get some soon! Yep, we’ve all had those days Nicole! Glad you were able to turn it around, skip the chocolate and get some downtime with t.v.! I taped the Biggest Loser – and haven’t seen it yet, but its all over facebook today so I know the results. Still going to watch it though! 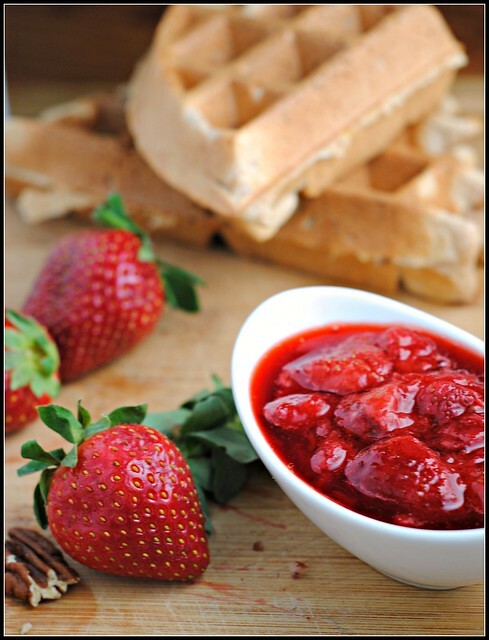 I am definitely going to try that strawberry sauce – love the addition of vinegar! I hear ya…I am the same way some days…and once I start crying it seems like for the rest of the day, every little thing sets me off! Good for you for resisting the chocolate…you are a stronger woman than I! These waffles look fantastic. Can you believe I don’t have a waffle maker? I am going to have to get one! I need a waffle maker in my life asap!